This weekend at the powwow an elderly gentleman asked me to stitch these arrowheads on to the leather pouch. He’d found the arrowheads in Arizona 20 years ago. He never knew what to do with them. A few weeks ago he purchased this leather bag, which hangs around his neck. 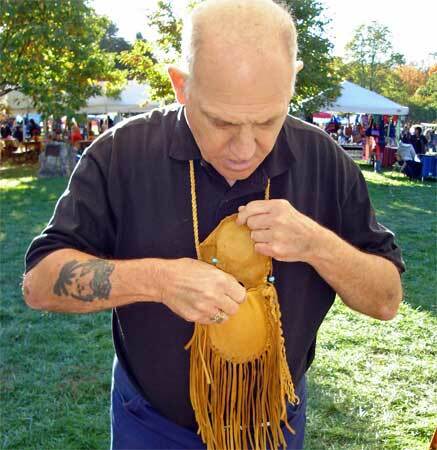 He now knew what to do with the arrowheads–add them to his pouch. Jim loading his iPhone into his newly embellished bag. 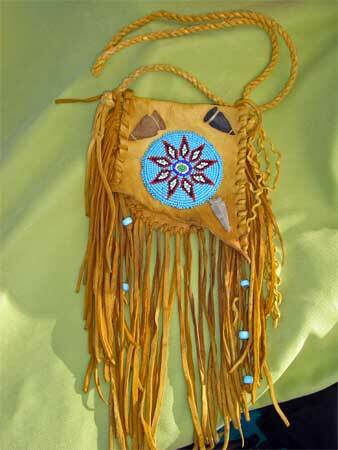 At powwows, bags hung around people’s necks are called medicine bags. People keep their “good medicine” in there: lucky charms, special beads, a chard of pottery, a feather, a note from a loved one. I expected him to extract a handful of trinkets from his bag, but instead, he pulled out an iPhone. For a guy 2 or 3 times my age, he has much more high-tech “medicine” than I do. This is why I continue to demonstrate at this powwow: You never know what interesting soul you’ll meet who will tickle your funny bone or turn your convictions on their head. In the weeks to come I will still chuckle when I think of those arrowheads, which could be hundreds, even thousands of years old, protecting, of all things, an iPhone. This entry was posted in About, Events and tagged arrowhead, leather, powwow by Susan. Bookmark the permalink. This is a great story. Thanks for bringing it to my attention.